CAMPER’s epic journey is nearly over. After 29 days at sea, Chris Nicholson’s lion-hearted crew are closing in on the Leg Five finish in Itajai, Brazil, where their frustration at having to sail an extra 2,500 plus miles compared with their rivals will be eased somewhat by the 15 points they will bag for finishing fourth. From leading the fleet in the early stages of the leg that started in Auckland, the boat fell victim to the merciless Southern Ocean that battered the fleet and eliminated two teams altogether. A damaged bow forced CAMPER to divert to Puerto Montt on the west coast of Chile for repairs, and lesser crews may have been tempted to throw in the towel. But not this plucky bunch. Four days later the boys were back in business, unfazed by the prospect of tackling Cape Horn’s hazardous waters. The repairs stood up to the test, and the team is less than 225 miles from Itajai. They are expected to arrive at 1200 UTC on Tuesday (April 17). That will give the crew precious little time before the Pro-Am Race on April 20 and the In-port Race the following day. Leg 6 to Miami will start on Sunday, April 22. CAMPER veteran Tony Rae said the weather had been kind to the team as their marathon nears its end. Rae insisted the crew had not gone easy on the boat after the repairs in Chile. “We haven’t just been cruising along, we’ve been pushing the boat as hard as possible in the conditions we’ve had without doing any damage,” he said. Although CAMPER is nearing the Leg 5 finish line, a windless hole off the coast of Itajai threatens to slow their push. Despite such an arduous journey, Hooper insisted the die-hard CAMPER spirit was very much intact. 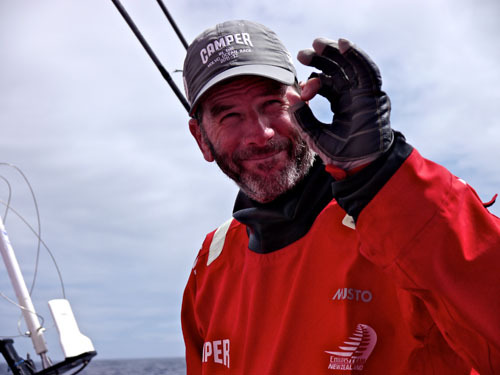 “As we come toward the end of this leg there is a real sense of steely resolve on board,” he said.